Apple CEO Tim Cook called Google out as an alternative to those dissatisfied with Apple’s Maps app earlier this morning. 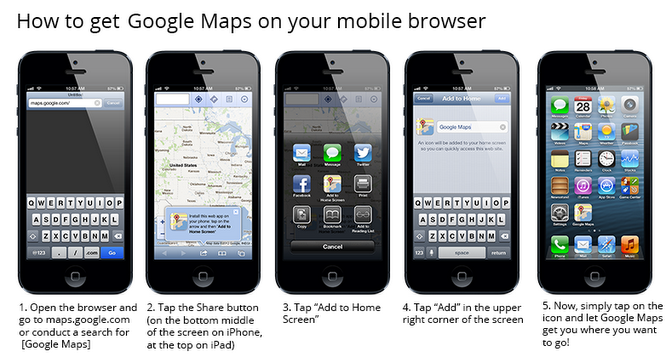 Now, Google has taken the opportunity to outline the steps that it takes to add the Google Maps web app to your iOS device’s home screen. The procedure is a simple one and has existed in iOS for a very long time. What is interesting about this is the timing. Google could have posted this on its official Google+ page at any time during the week, but it only did so after Tim Cook mentioned using the Google Maps web app in his apology letter this morning. Now that Cook has openly acknowledged the weaknesses of Maps, Google is free to offer up instructions like these without looking like it’s openly gloating (unlike some other companies). And now the pressure is off of Apple and onto Google to deliver a native app as soon as possible. Getting an alternative onto the platform was important when everyone knew that Maps weren’t great, but it’s doubly so now that Apple is openly inviting competition, even recommending apps on the App Store in a custom section.